Hey all you lovely ladies out there! 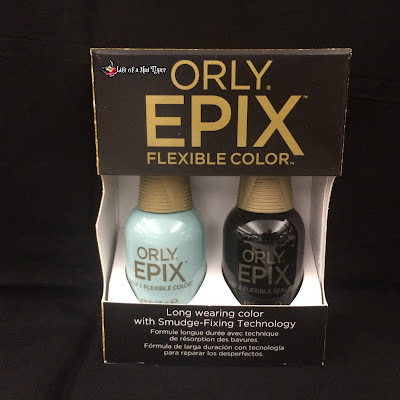 I got the opportunity to work with Beautybrands.com recently and they sent me one of the Orly epix flexible color polish. I had heard of this new collection from Orly and was super excited to try them out. This ingenious system represents the next generation of nail color, delivering an exceptionally rapid 2-step application that lasts over a week and removes with ease. Not only does this revolutionary nail color formula provide extended wear, but it also allows the finish of the manicure to bounce back, to prevent smudges during the drying process. EPIX Flexible Color and Flexible Sealcoat fuse together to create a durable, scratch-resistant, high-shine finish that dries in less than 8 minutes. The color I received is Cameo which is such a classic pastel blue that reminds me of older times. I know I wasn't alive then but it reminds me of a far far away time, almost fairy tale like. It applied evenly and easily with just 2 thin coats and 1 coat of topcoat. The shine on these babies is glorious I found myself staring at them throughout the day after applying. The dry time was super quick and I was actually quite shocked I didn't mess them up while typing right after applying. I decided to test the flexible part out because I really wanted to see if it worked. While it hurt me at the thought of denting this beautiful blue I used one of my nails on my right hand and made lines through the polish and then when I felt I had made enough I went to bed. When I woke up I was amazed that the dents were all gone. SO even though I was skeptical about the flexible part it really did work. Orly has been one of my favorite mainstream brands for awhile and this just made me realize all over again why I love them. Orly Epix Flexible Color Nail Polish in Cameo on Amazon. Ooohh pretty! Orly is one of my favs as well.